Describing his role as Speaker of the House of Commons as the greatest honour of his professional life, the Right Honourable John Bercow MP gave a public lecture and a guest lecture to Politics students at Ulster University. 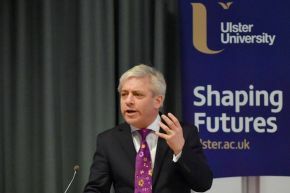 Forming part of the University's prestigious Parlimentary Studies module, which is approved and co-taught by senior House of Commons and Ulster University staff, the guest lecture was part of a wide range of activities that aim to inform and inspire those considering a range of graduate level careers, including careers in politics. Ulster University is one of just 13 universities in the UK selected to deliver the Parliamentary Studies module.